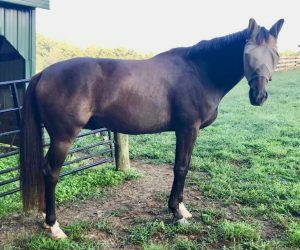 Abstract: Pete is an 8 year old Thoroughbred gelding that presented for management of back and neck pain with acupuncture. He has a history of hind limb lameness. During examination prior to starting his acupuncture treatments, Pete was lame in his left front; lameness worsened over the next month as the ground froze. Through diagnostic nerve blocks, radiographs, and ultrasound, the lameness was localized to his foot and degenerative changes were identified in his navicular bone. Pete’s neck and back pain responded well to acupuncture treatments. The left forelimb lameness improved with acupuncture, shoeing changes, and coffin joint injections; further management of this lameness is ongoing. 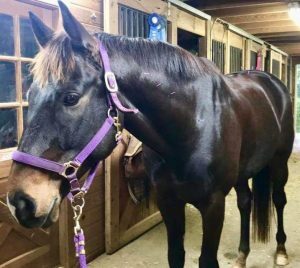 History: Pete is an 8 year old off the track Thoroughbred gelding. 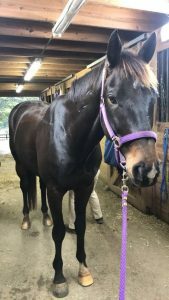 He is currently used for lower level dressage and trail riding. Pete lives out full time in a large grass field with two herd mates. Pete’s owner noted that he is very back sore and has been short-strided in both front limbs. Pete had surgery while he was on the track for an osteochondritis dissecans (OCD) lesion in his left hock. He has a history of hock and stifle osteoarthritis – hock radiographs 10/31/17, stifle radiographs 9/18/17. Pete has not had any joint injections while in his current owner’s care. He has been in front shoes since September 2018 and was previously barefoot. 10/31/19 – Pete was bright, alert, and responsive. Temperature 99.7 degrees Fahrenheit, heart rate 36 beats per minute, respiratory rate 12 respirations per minute. Dermatitis was noted on all four palmar/plantar pasterns, making Pete reactive to palpation of his limbs distal to the fetlock. All four limbs palpate normally without heat, pain, or swelling. Stomach 7 was moderately reactive to palpation bilaterally. Pete was moderately reactive to palpation of his cranial neck bilaterally, with normal range of motion. Corresponding muscle atrophy was noted through his neck. There was moderate reaction to palpation along the Bladder line from the thoracolumbar junction through the lumbar spine. Decreased lateral bending through thoracic and lumbar spine with normal rotational bending was noted. The left sacroiliac had decreased motion, but was non painful to manipulation. Pete was resistant to caudal movement of his scapula, left more than right. Otherwise there was normal range of motion in all distal limb joints with no resistance to passive flexion. Hoof tester response was negative in all four feet. Pete was evaluated in-hand and under saddle. The left hind limb had shortened cranial phase of stride tracking right. He was also short strided in both front limbs, worse tracking left. The shortened stride worsened when Pete was under saddle and ridden in collection, asked to flex his neck. No ataxia was noted. Backing, circling, and proprioception were all normal. No weakness was noted. 12/11/18 – Consistent left forelimb lameness was noted at the trot, worse tracking left. The left forelimb lameness is worse on hard ground. Pete continues to be bilaterally short strided when collected under saddle. No reactivity to palpation of Stomach 7. Moderate reactivity to palpation of cranial neck and along Bladder line from thoracolumbar junction through lumbar spine bilaterally. Lateral bending in thoracic and lumbar spine was slightly improved. Normal motion in the sacroiliac was noted. Hoof tester response remained negative. Flexion tests were performed under saddle during a comprehensive lameness exam. Pete was mildly positive to flexion of the left digit and mildly positive to both stifle and full limb flexions in both hind limbs. 1/9/19 – Pete’s left forelimb lameness worsened as the ground froze. He remained consistently left forelimb lame in both directions on soft and hard ground. Palmar digital nerve block produced 70% improvement of left forelimb lameness, a low abaxial block produced 90% improvement. Radiographs were obtained of the left digit, identifying significant degeneration of the navicular bone. A single radiograph (65 degree DP) was obtained of the right front identifying similar changes in the right front navicular bone. Foot balance radiographs were obtained of both front feet, showing a negative palmar angle and long toes bilaterally. 1/16/19 – Ultrasound of the left front limb distal to the fetlock was unremarkable. 1/26/19 – Some improvement was noted in Pete’s left front lameness. He is intermittently left front lame, worse tracking left. Both hind limbs have shortened cranial phase of stride. Mild coffin joint effusion was palpable in both front limbs. Moderate reactivity was noted to palpation of neck, worse on the left, mild reaction to palpation of back along Bladder line from thoracolumbar junction through lumbar spine. Mildly reactive to palpation over left and right gluteal muscles, extending down semimembranosus and semitendinosus muscles. The muscle development through Pete’s neck and along his topline, most notably through his gluteal muscles and caudal back, has improved. Slightly restricted lateral bending through thoracic and lumbar spine and good rotational bending were noted with spinal manipulation. 1) Left forelimb lameness: Coffin joint synovitis, coffin joint osteoarthritis, navicular bone degeneration, deep digital flexor tendon injury, collateral ligament desmitis, pedal bone bruising. 2) Neck pain: cervical facet osteoarthritis, referred/compensatory pain from left forelimb lameness. 1) Left forelimb lameness: Navicular bone degeneration is the most likely differential diagnosis. Diagnostic nerve blocks localized the lameness to the left front foot, primarily caudal heel. Radiographs confirmed significant degeneration of the navicular bone. A soft tissue component with deep digital flexor tendon involvement cannot be completely ruled out without an MRI, which is not an option for this patient due to financial limitation. 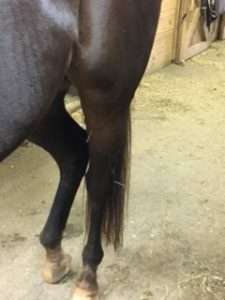 The patient’s response to treatment so far (shoeing changes, coffin joint injections, and acupuncture) is favorable and further supports the diagnosis. 2) Neck pain: The neck pain is most likely a combination of primary changes in the neck, such as osteoarthritis or cervical facet joint synovitis, and referred pain secondary to front end lameness. 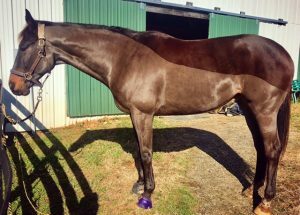 A primary neck problem is likely as Pete continues to become short strided in both front limbs with collection/flexion of his neck under saddle, despite improvement in his left front lameness with treatment. Radiographs and ultrasound of the neck could confirm this suspicion, but have not yet been performed due to client financial restrictions and Pete’s neck pain and muscle atrophy are improving with acupuncture treatment. Medical Decision Making: The primary goal of treatment initially, based on the owner’s perceived primary problem, was to address Pete’s neck and back pain. Through subsequent examinations, my objectives became to manage Pete’s neck and back pain while also addressing his forelimb and hind limb lameness. Pete had acupuncture treatments every 6 weeks due to scheduling limitations (the initial goal was to treat every 4 weeks). All treatments started with Large Intestine (LI) 16 and Bai Hui to determine the patient’s receptivity to needling and for endorphin release, decreasing anxiety. Both the neck pain/muscle atrophy and front-end lameness were addressed by choosing point locations along the cervical spinal cord segments. Small Intestine (SI) 3 was chosen as a distal point to address neck pain via the ulnar nerve and to address foot pain. Large Intestine (LI) 11 was chosen as a distal point to address the caudal cervical spinal nerves via the radial nerve and as an autonomic anti-inflammatory point. No points distal to the fetlock were acupunctured due to his dermatitis. Bai Hui and points along the Bladder (BL) line from BL 18 through BL 27 were treated to address back pain, range of motion, and pelvic limb lameness. Stomach (ST) 36 was chosen as an autonomic point to address general hind-end pain and for anti-inflammatory effects aimed to address both orthopedic inflammation and pastern dermatitis. BL 40 and BL 62 were treated as local points to address stifle and hock pain respectively. Pete was treated every 6 weeks for a series of three treatments with dry needling using Seirin J-Type acupuncture needles (size 0.25 mm diameter, 30 mm length on trunk and above the tarsus/carpus, 0.20 mm diameter distal to carpus/tarsus). After the first treatment, electroacupuncture was used from BL 18 through BL 27 and BL 27 to BL 54, using the ITO unit at 2 Hz across each segment treated for 5 minutes per segment. The points treated at each session are denoted below by date. 10/31/18: Treatment was initiated with LI 16 and Bai Hui as described in the above section. BL 18, 21, 24, 26, 27 were addressed for back pain, range of motion, and pelvic limb lameness. BL 40 and 62, ST 36, LI 11 were treated as described in the above section. ST 7 was treated with a 0.16 mm diameter, 30 mm length Seirin needle to treat local reactivity to this point. LI 17, Triple Heater (TH) 16, and SI 16 were treated to address neck pain and local muscle atrophy. 12/11/18: The above treatment outline was similar in respect to dry needling locations. ST 7 was not treated as this point remained non-reactive at all subsequent examinations. The following points were added: SI 3 was treated to address neck pain and forelimb lameness, BL 54 and Gall Bladder (GB) 29 were added for local pain over gluteal muscles. Electroacupuncture was applied from BL 18 to BL 21; BL 21 to BL 24; BL 24 to BL 26; BL 26 to BL 27; and BL 27 to BL 54 for a minimum of 5 minutes at each span. 1/26/19: The same treatment was administered as on 12/11/18. In addition to the above-described acupuncture treatments, shoeing adjustments were made to correct the imbalance identified on radiographs and elevate his heel to relieve caudal heel pain (the farrier brought back Pete’s toe to ease break over and applied a 2 degree leather rim pad). Pete’s front coffin joints were injected on 2/6/19 with Hyvisc, triamcinolone, and amikacin to manage his navicular syndrome. Pete responded well to acupuncture treatments. The reactivity to palpation over his neck and back improved slightly. Most notably, the muscle development over Pete’s topline from his thoracolumbar junction through both gluteal muscles dramatically improved, along with his range of motion. The muscling over Pete’s cranial neck also improved. Pete’s diagnostic acupuncture exams aided in the identification and diagnosis of his frontend lameness. Concurrent acupuncture treatment along with conventional western medicine applied to address Pete’s navicular syndrome appeared to speed Pete’s recovery time, helping to relieve secondary neck pain so that he returned to a more normal gait quickly following treatment of his coffin joints. Pete was last evaluated on 2/20/19 for follow up soundness exam. At that time, he had significantly improved cranial phase of stride in both thoracic limbs and more normal, neutral head and neck carriage (his neck was held level and extended with his body arced along the diameter of the lunging circle where previously he would hold his head/neck to the outside). 1) Hackett, G, Spitzfaden, D., May, K., Savoldi, M., Dodd, M. Acupuncture: Is It Effective for Alleviating Pain in the Horse?, in Proceedings. Am Assoc Equine Pract 1997; 43: 333-335. 2) Xie, H., Ott, E.A., Colhan, P. Influence of Acupuncture on Experimental Lameness in Horses, in Proceedings. Am Assoc Equine Pract 2001; 47: 347-357.